Texas Custom Mirrors just completed a unique mirror job for Bobs Chop and Steak House in the Woodlands. The Woodlands in a north Houston suburb and a very fast growing area. 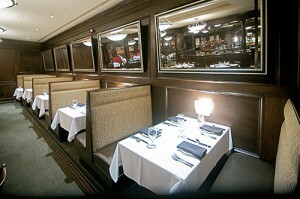 This is the third custom mirror job we have done for this restaurant. The other two were in Austin and San Antonio Texas. We not only did custom mirrors but also designed all artwork for the walls for installation. The mirror installation was unique in that the mirrors needed to lean away from the wall at the top. This way customs can see themselves as they walk up the be seated. We used heavy duty z bar kits for this special installation. This mirror job had to be done after completion of build out and before the grand opening of the restaurant. This required long hours at the last minute this large job in less the 48 hours. Most grand openings are very stressful times for owners and at Texas Custom Mirrors we try hard towork around the schedule of any owner. These mirrors were beveled and built in assorted sizes. The largest was about 80″ by 40″ inches. When you use beveled glass it makes a mirror very heavy because of the thicker glass. These mirrors are unique because they are double framed. A double frame is when you combine two frames and attach them so they look as one. One of the frames was black with silver and the inner frame was a silver bead. It really made a beautiful combination. 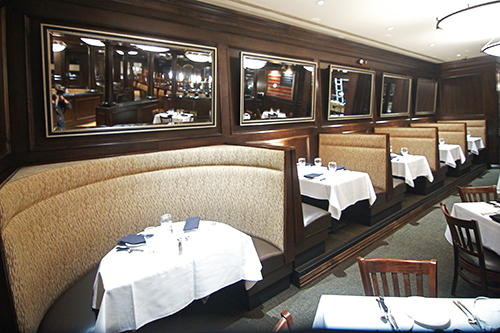 Please consider Texas Custom Mirrors for the next commercial mirror job you need.